Use up any left-over turkey by tossing together Siúcra’s warm turkey salad with pickled cranberries. 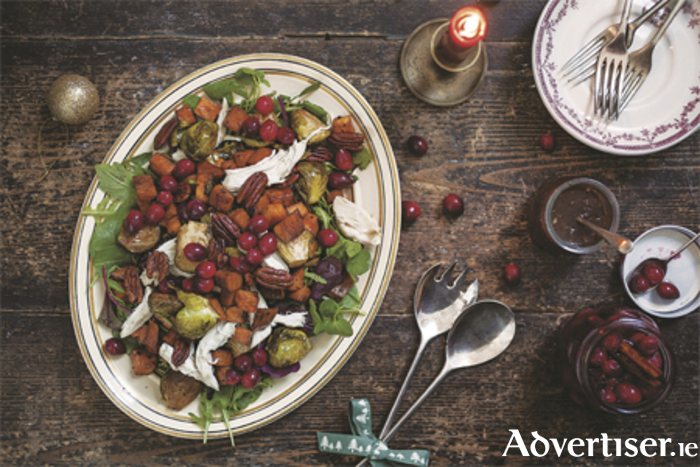 This delicious festive salad combines all of the flavours and colours of Christmas with sweet cranberries, pickled with Siúcra Caster Sugar, and sweet potatoes, Brussels sprouts and pecans, caramelised using Siúcra Rich Dark Brown Sugar. It is the perfect light meal to serve on St Stephen’s Day after the indulgence of the day before. Combine the Siúcra Caster Sugar, cider vinegar, cinnamon sticks, allspice, cloves, black pepper, and salt in a saucepan over a medium-high heat. Bring to a boil and cook, stirring, for three minutes until the sugar has completely dissolved. Stir in the cranberries and cook for six minutes until they start to pop open. Spoon into one large sterilised jar, or three jam jars, and seal. Preheat the oven to 200C/180C fan/gas mark 6 and toss the sweet potato cubes and sprout leaves with the Siúcra Rich Dark Brown Sugar, oil, red wine vinegar, and some salt and pepper. Dot over the butter and roast for 20 minutes, stirring halfway through, until tender. Add the pecans to the tray and roast with the sweet potato and sprout leaves for another 10 minutes until the nuts are fragrant and the vegetables are caramelised. Meanwhile, combine all of the ingredients for the dressing, except for the oil, in a bowl until combined. While whisking constantly, slowly stream in the oil until incorporated. Combine the sweet potatoes, sprout leaves, turkey, and salad leaves in a large bowl. Add enough of the dressing to coat, then toss. Transfer to a serving platter and garnish with the pecans and some of the pickled cranberries.